It has been said that one of the biggest mistakes that can be made in photographing sunrises and sunsets is leaving too soon. Often, there is beautiful color to be seen and photographed for twenty or thirty minutes after the sun sets. Likewise, when waiting to photograph sunrise, things can change rapidly and unexpectedly. Such was the case when we were photographing sunrise during the recent Smoky Mountain Fall Workshop that I attended with Nancy Rotenberg, Don McGowan, and Les Saucier. But it didn't start out that way. When our group arrived at the overlook that had been chosen for that morning's shoot, the sky seemed quite densely 'fogged in'. It didn't appear that we were likely to be able to make good images from that location and there was talk of trying to move to a different spot, perhaps one at a different elevation in the hopes of getting better conditions for photographing. By that time, however, it was getting late and it was a bit questionable that we would be able to find a new locale and be able to get set up in time for sunrise. So, with a tiny sliver of clearing in the distance, we decided to stick it out in the hopes that the dense fog would lift as the sun came up. What developed was unexpected and truly exhilarating. Over the next few minutes, the little sliver of clearing continued to open and we were treated to a truly moving experience. 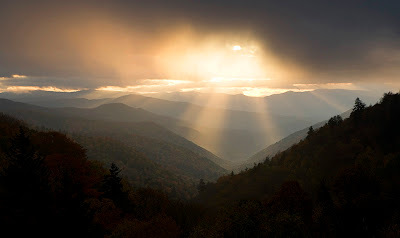 The cloud cover was such that there was a number of 'God Rays' that emerged and, one by one, they swept across the valley below in a spectacle that was akin to a natural laser light show, only better. As I rapidly 'play back' the many images I took that morning by quickly viewing them one after another in Lightroom, they seem like a movie that allows one to relive the entire experience, complete with the rays sweeping and dancing rhythmically along one side of the mountain, into the valley, and back up the other side. Rather than frenetically chasing after the perfect shot, sometimes it is better to stay put and let the shot come to you.